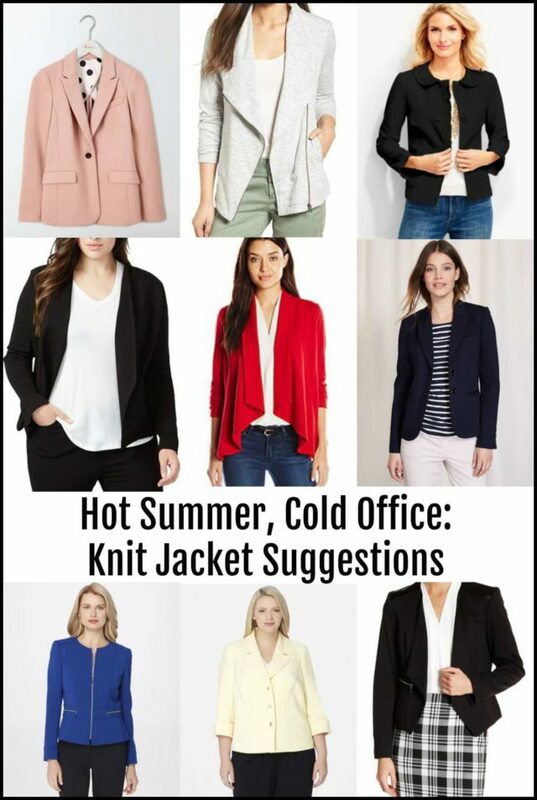 If you follow Wardrobe Oxygen on Facebook, you probably already know the answer to the post title – the best office jacket for spring and summer is a knit one. With a structured shape but made out of a soft stretchy fabric, this jacket will be the perfect way to transition from a sweltering summer outside to frigid cold temps in an overly air conditioned workplace. You can shove up the sleeves, throw it over your desk chair, even place it over your lap and not worry about wrinkles. With the right shape, this knit office jacket will look equally chic with chinos and a knit top as it will with a tailored sheath dress. I believe in having an office jacket, that piece that stays at the workplace. 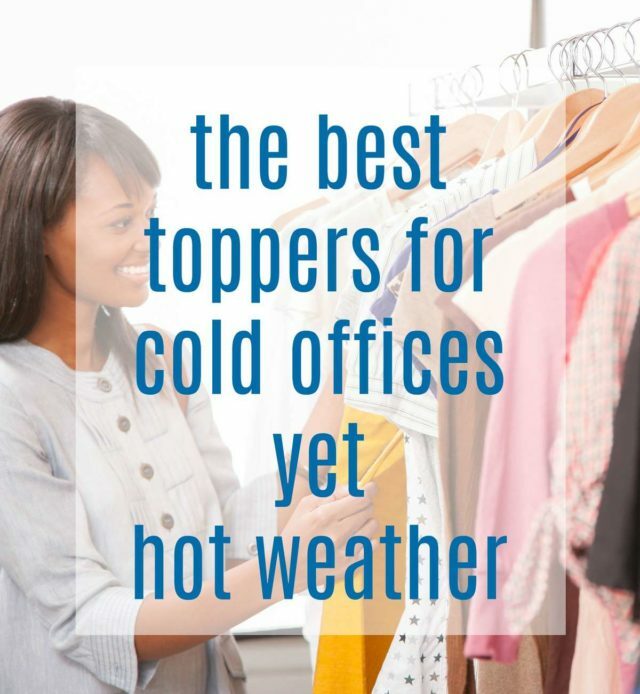 Whether you keep it on a hanger on the back of your office door, or sling it over your chair in your cube, it’s good to have on hand not only for too cold A/C, but those last minute meetings with a client or an unexpected interview. Nothing says business more than a jacket, and if you choose wisely, it can even make jersey sundresses and jeans look semi-professional. The soft jacket is more structured than a cardigan, but not as crisp as a classic blazer. Think one-button blazers, jackets with a waterfall front, moto-inspired toppers, and structured elements like mandarin collars, epaulets, buttoned cuffs, and seaming. Unlike a hoodie, there are no athletic details – no knit cuffs, hoods, or traditional closures and hardware found on anything from Sports Authority or REI. Steer clear from the details that will make this jacket look more casual: unfinished hems, exposed seams, garment dyed or contrast stitching, the incorporation of waffle/thermal knit, anorak-style drawstring waist, visible snaps like a denim jacket, or lots of pockets and closures like a safari jacket. While prints and patterns may seem like a smart choice to offset solid clothing, it can actually read more casual and more wintry. Other than heathered greys and other dark neutrals, I recommend if you’re picking a jacket for the office stick to a solid in a color that complements the majority of your office wardrobe. For some, that would be black, navy, grey, or olive. For others, that may be a soft pink or taupe. You may find a jacket in peacock blue or deep plum may be more versatile than brown or black. This is the kind of jacket you can own more than one of. While you may have a classic black, navy, or charcoal version in your office, consider a different color to wear for the weekend with a striped tee and jeans or a tank and chinos. If it comes with coordinating separates, consider buying the matching trousers or skirt for a comfy version of a work suit. When I used to travel regularly for business, my black ponte pantsuit was the hardest working item in my closet and put in my suitcase for almost every trip. I find ponte matches ponte quite often, even if the pieces are from different retailers. Pair a ponte blazer with a ponte sheath dress, a ponte moto jacket with ponte trousers, a ponte pencil skirt with a ponte trench-inspired jacket. Knit jackets can offer much style beyond the cold summer office. The gray moto. I die for that. I have a similar black ponte moto that was an office workhorse. Yes! I’ve been meaning to reply to your fantastic email – but this post is a godsend – and totally necessary with these crazy summer & A/C temperatures!! This is so relate able Allie!! I always say I need a jacket for the inside in the summer. Not the outside!! Any suggestions for a longer (to the knee … sort of a duster type of jacket) that is nice in a crepe type fabric that could be worn pretty much any season? I had one years ago from Talbots and wore it out…it went over a skirt and blouse, a tee and jeans, a sheath dress…so versatile and impossible to find again. That sounds great and I would like to have one. If you happen to find one, would you mind dropping by here again to tell us where you got it? It would be much appreciated. Will do. It really was such a versatile piece. Smarter shop at this point in my life and if I still had it I would take it to a seamstress to see if they could take it apart to use as a pattern and make a new one.